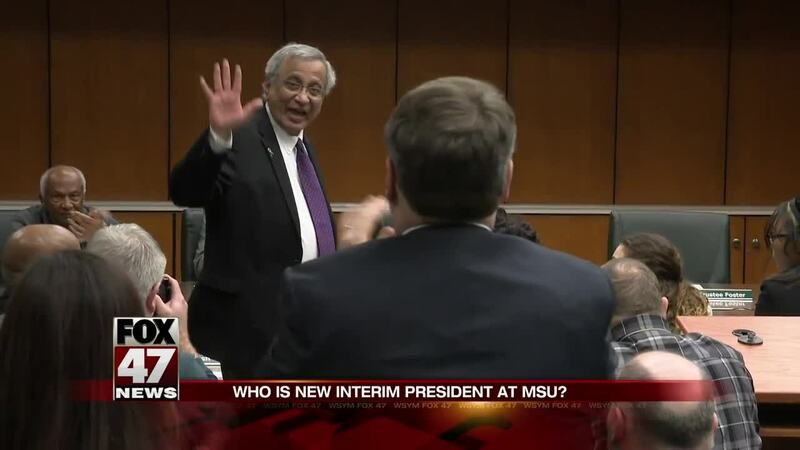 Satish Udpa: Who is MSU's new interim president? Just moments after the Michigan State Board of Trustees voted to accept interim-President John Engler's resignation effective immediately, they approved a motion to appoint a new leader. EAST LANSING, Mich. — Just moments after the Michigan State Board of Trustees voted to accept interim-President John Engler's resignation effective immediately, they approved a motion to appoint a new leader. Satish Udpa waves after being named interim president of Michigan State University, Thursday morning, Jan. 17, 2019, during a Board of Trustees meeting at the Hannah Administration Building at MSU in Lansing, Mich. The board acted Thursday, a day after John Engler said he'd step down next week . Engler's resignation comes amid fallout from remarks he made about some victims of former sports doctor and convicted sexual abuser Larry Nassar. (Matthew Dae Smith/Lansing State Journal via AP) Satish Udpa will be taking over that role. Udpa is an experienced campus leader who is coming in ready to lead the university in turmoil. "This institution means a lot to me, and it means a lot to the citizens of Michigan. So it would have been irresponsible on my part not to have undertaken this," Udpa said. Udpa has been with the university since 2001, most recently serving as executive vice president of administrative services since 2013. The 68-year-old has also served as dean of the College of Engineering for several years and chair of the Electrical and Computer Engineering department. He also worked at Iowa State University and Colorado State University, where he received his Ph.D.
Upda said he would not be a candidate for the permanent president position.